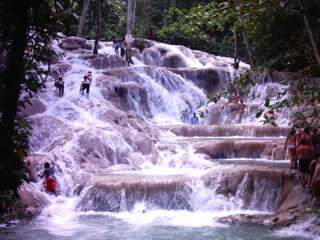 Dunn’s River Falls in Ocho Rios, Jamaica is among one of the most spectacular natural formation in the Caribbean. The Dunns River Falls cascade over smooth lime stone rocks, through the tropical rain forest all the way to the white sandy beach below. You can climb up the water falls which is 183 meters (600 feet) high. The Spaniards called the area “Las Chorreras”, the waterfalls or springs. The name “Las Chorreras” has degenerated over the years to “Ocho Rios” (meaning eight rivers). Described as a living and growing phenomenon, it continuously regenerates itself from deposits of travertine rock, the result of precipitation of calcium carbonate with thermal spring activity found in limestone caves. You can climb the Dunns River Falls in a human chain led by an experience guide, who will also take your camera and pictures as you climb. You will also be accompanied by a videographer who will make a video of your climb, which you can purchase at the end of your climb on a DVD.